My second day at the AAMFT conference was less sparkly than my first, but still interesting. My two workshops were centered around the neurobiology of childhood trauma (which I find fascinating) and using play therapy to treat traumatized kids, and around situational couples violence and using an attachment-based theory to treat it. While I love learning about trauma, I am going to focus this blog post on situational couples violence and attachment theory. So in talking about situational couple violence, the presenters proposed using a theory that encompasses attachment theory to help couples deescalate emotionally charged situations and remain violence-free. Secure – It is relatively easy for me to become emotionally close to others. I am comfortable depending on others and having others depend on me. I don’t worry about being alone or having others not accept me. 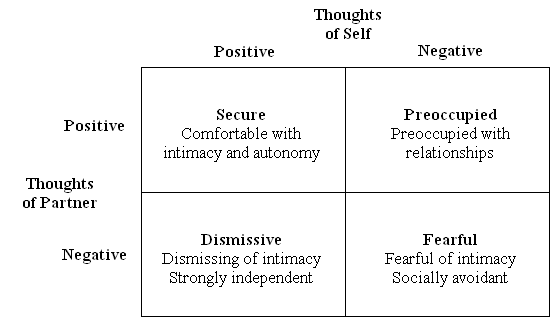 Dismissive – I am comfortable without close emotional relationships. It is very important to me to feel independent and self-sufficient, and I prefer not to depend on others or have others depend on me. Preoccupied – I want to be completely emotionally intimate with others, but I often find that others are reluctant to get as close as I would like. I am uncomfortable being without close relationships, but I sometimes worry that others don’t value me as much as I value them. In the workshop I went to, the presenters proposed that violence within the context of situational couple violence can be a response to attachment related fears or panic, and that people can or may use violence to regulate their attachment distress. So, a preoccupier might become violent to regain proximity to their partner, or a dismissive type might use violence to become more distant. The presenters described how trying to change the “dance” for couples could help them deescalate conflict. If one partner knows they are a preoccupied type and the other knows they are a dismissive type (which, by the way, is a very common dynamic in couples), they can create strategies that help both of them reduce their attachment fears so that violence doesn’t occur. So during a conflict, they might decide that the dismissive partner can take a break, but when they are back, the two of them will discuss the conflict and the dismissive partner will give the preoccupied partner reassurance about their love for them. This “dance” is very similar to the pursuer/distancer dynamic that I think I have mentioned elsewhere on this blog (it describes the roles J and I take on under relationship stress and conflict, although our awareness of our dance has helped the dance slow down and become less extreme). This entry was posted in Communication, Relationships and tagged attachment, counseling, domestic violence, education. Bookmark the permalink.